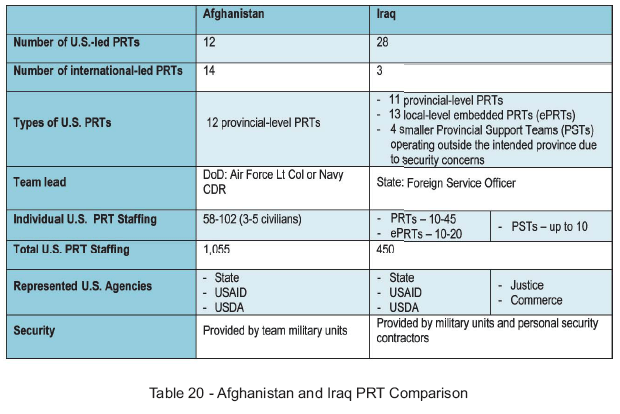 Expanded PRT Model for Afghanistan – 215 New Civilian Positions? When I read that news clip on the Secretary’s cable recruiting 14 officers for Herat and Mazar e-Sharif — I thought wow! I actually expected that the call up would be for a far higher number than that. It looks like the personnel requirement may actually be more than what is currently announced. After some digging, I found the report submitted by SIGAR to Congress in January this year. In it the Special Inspector General for Afghanistan Reconstruction (SIGAR) writes about an expanded PRT model for Afghanistan proposed by US Embassy Kabul. It is not just talking about Provincial Reconstruction Teams (PRTs), but also Provincial Governance and Development Offices (PGDOs), District Support Teams (DSTs) and the creation of Fly-Away Teams of one to three civilians (State/USAID/USDA). SIGAR states that since 2001, the United States has appropriated over $32 billion in reconstruction assistance to help reconstruct and secure Afghanistan but that conditions in Afghanistan—economic, geographic, and demographic, and political—offer unique challenges to the feasibility and sustainability of reconstruction efforts. It is entirely possible that the new administration will not buy into all that’s in the proposal – but considering that Afghanistan is front and center in the new administration’s efforts in the region – I won’t be entirely shocked if the civilian numbers will go higher than 14 or higher than what is in this report. If you are considering service in any of the Afghanistan PRTs, check out this DOD report on Afghanistan. It includes a section on US-led PRTs, including each team’s one-year and three-year goals in each area of operation. « Wanted: Expressions of Interest – Herat, MeS and ?? ?